The menu takes its influence from the current food trends popularized by the food truck scene across America. We want to play with the idea of 'American comfort food', where classic dishes are designed to make you smile when you see them on the menu. Excellent,only thing that I didn’t like was the fact you took more money off my credit card than you said in case I ate or had drinks while I stayed with you you took over £400 granted you have put it all back after complaining,you shouldn’t do this . I had a fairly good stay at the Novotel. This was a reasonably good stay but I have a few complaints. There needs to be better lighting in the bathroom, which is way too dark. Putting on make-up was very difficult. A lighted , magnifying mirror would have been a help. I was unable to get the correct time/date on the radio. And finally, there was a huge, extremely loud party that took over the entire bar area. I was on the 19th floor and could here it up there. Very annoying. We a had a nice easy stay. With nothing going wrong. Great stay with just a few minor frustrations. The hotel was lovely and clean, friendly staff, great location and good facilities. The only issues we had was room service tray left outside of our room by cleaning and then not picked up for two days. There was no draft beer at the bar for at least three days. It would have been nice to be told in advance of our stay that you have to pay quite a reasonable amount in advance to cover potential room service costs etc. This surprise could cause some travellers a big issue. In general though, I was very happy with our stay. I go to NYC twice a year with my family. I have been staying at the Novotel because the service, location, safety and staff have been amazing. However, I was extremely disappointed this time. There was a private party that was loud and obnoxious. NO one let us know that the restaurant bar and patio would be closed to guests! We stay to the Novotel for the roof top patio and dinner. We were not able to even get a glass of wine! We had to take our dinner and drinks plan some where else last minute! We were celebrating my daughter that night and planned to meet friends at our hotel. It was embarrassing and inconvenient. I needed an extra blanket and it took over an hour and 3 phone calls. The noise from the party did not allow us to sleep. As a matter a fact we could not even converse with the front desk because of the noise. We left in the middle of the night. I am not sure if would recommend or come back. I feel horrible about it but our vacation was ruined. Only positive was the door man Juan who always treats us well! Very nice stay. Ian checked my daughter and I in, he was so informative about the city and helped us navigate the subway. He was awesome! Also, the guys checking the luggage when you first enter the hotel always said good morning or good afternoon, super friendly! I would ay here again. I was on the higher floor with pretty good views of Times Square albeit slightly obstructed view. The roo. Was clean, smelled fresh. No coffee maker though. Your European counterparts had Nespresso. When it rains they have umbrellas to offer the guests. Here, none. Front desk people could be warmer. But hey it's NYC. I guess. Great location and satisfied with customer service. There was a very sweet bellhop that greeted us every time we walked through the doors and said goodbye everytime we left. He was great. Also - our ride to the airport was great! Our driver was very kind and even told us about some history on the ride over. I always stay at Novotel when I’m in the city. It’s a beautiful and trendy hotel in the heart of NYC! Also, there’s such a friendly environment at Novotel - smiling faces everywhere you go! Great stay in really nice clean rooms and in an excellent location! Stayed with my family (two kids, 6 and 10) for a week long New York sightseeing trip. Got one of the best rooms (32nd floor straight Times Square view) and got seated two times for the best (times square corner) breakfast seat (thanks to Enellie). All in all an amazing trip, felt treated and rewarded. 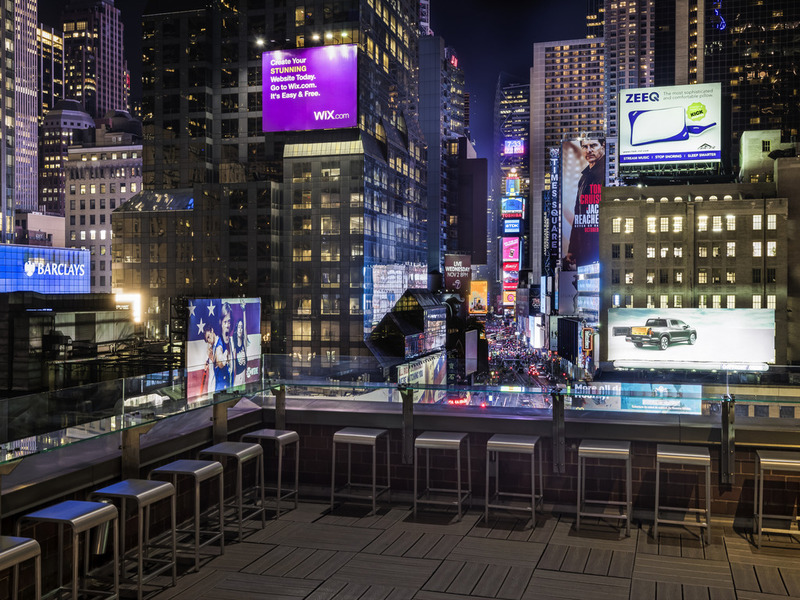 It is conveniently located in the heart of times square, close to everything! The rooms are just the right size, and the beds were very comfortable. It was fine and as expected really. We hadn't been given a room with a bath as requested but this was rectified very quickly. Fantastic location and door staff were excellent Reception was a bit cold and when I asked the concierge a question he was very dismissive and went back to searching the internet! No Coffee facilities or Water in the room (complimentary or to buy) Although only a short stay it was not what I had experienced at three other Accor sites over the last 3 weeks. I booked room 3 months in advance, however when I arrived they did not have the room booked (on the upper floors). The hotel gave me a room other than the booked and then had to change during the stay, totally unacceptable. Do not understand!